Temperatures are dropping and Thanksgiving is upon us. You know what this means. Before you know it you will be walking through the mall with Christmas music ringing through the air. Don’t get me wrong, I am pumped for sweaters and blankets by the fireplace. 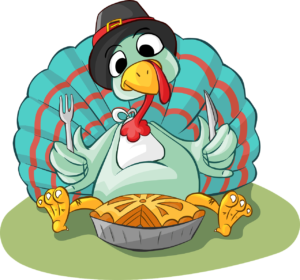 Turkey dinners and pumpkin pie and all the other good stuff that is coming my way. But as a health professional I know it can be a challenging time to prioritize your health during the holidays and I am here to make it a little less challenging for you. I get that we don’t want to miss out on dinners out and social occasions with friends and family. You may also find yourself traveling and out of your usual routine, but one thing that can give you a sense of control is finding ways to make easy modifications to keep your health a priority. Holidays and family time can be fun, but it can also bring on extra stress. For me nothing helps better with coping with stress than maintaining my diet and fitness as much as possible. First things first, make a commitment to keep yourself and your health a priority. It’s really that simple. Decide you will and honour your word. You can enjoy your holidays AND take care of yourself. Guess which will feel better come January 1st? Fun fact, there are 86 days left in 2018, plenty of time to put them to good use. Shorten your eating window: Night outs often fall on weekends, making it easier to shorten your eating window as you may be sleeping in a little more naturally. Delay your first meal by a few hours and go straight to lunch/brunch. Cutting out one meal and banking some calories for your night out. This is a strategy I will employ when I have a quieter mornings and I don’t mind being a little hungry. Be careful here, if you don’t fast often, skipping a meal can lead to over-eating later in the day. Know yourself and what works best for you. Eat around your meal out: Build a cushion in your day by saving calories and macros for your night out. Fill up on lean protein and veggies. By eating higher volumes of food rich in fibre you can still feel satiated during the day but save the bulk of your carbs + fat for your meal out. This does not mean to cut out all carbs, non-starchy vegetables can be quite filling and don’t take a big hit in your macros. You can have yourself a giant salad for lunch or make a big omelette. The idea is not to go hungry but to be mindful. Cut down on snacking all day. And drink your H20! Exercise moderation & portion control: Remember this isn’t your last meal out and final opportunity to enjoy good food. So don’t eat like it is! If your dinner is a Buffet Style, serve your food onto one plate. Sit down, enjoy your meal. Make sure you fill your plate with everything you want. No regrets. And when you are done, you are done, put that plate away. Focus on the people not just the food: It’s okay to LOVE your mom’s pumpkin pie or mashed potatoes. I personally look forward to my mother in law’s stuffing all year. But remember that what makes is special is your mom and the time spent with the people in our lives. Don’t spend your entire evening standing by the chip bowl. Socialize, make eye contact and stop chewing. Bring a dish to share that you can enjoy. Lighten up a family favourite or be that girl who brings veggies and dips to the party, just make sure you bring a really good dip! It’s okay to say no: This is a big one and we have a lot of emotional baggage sometimes around food with our families. Make sure that you don’t feel obligated to eat all of the treats given to you. Or have a cup cake every time it’s someone’s birthday at the office. You always have a choice. If you do want it, take some and enjoy it, if you don’t really want it or need it, politely say no. Simple as that. Remember a little of something will not break progress, but a lot of something may.